and alsoe a gill of sack and work it in your botle as if you were churning it, then after you have wrought it after that maner a considerable space pour it into your dish being seasoned with rose water and put in a litle yearning amongst it. 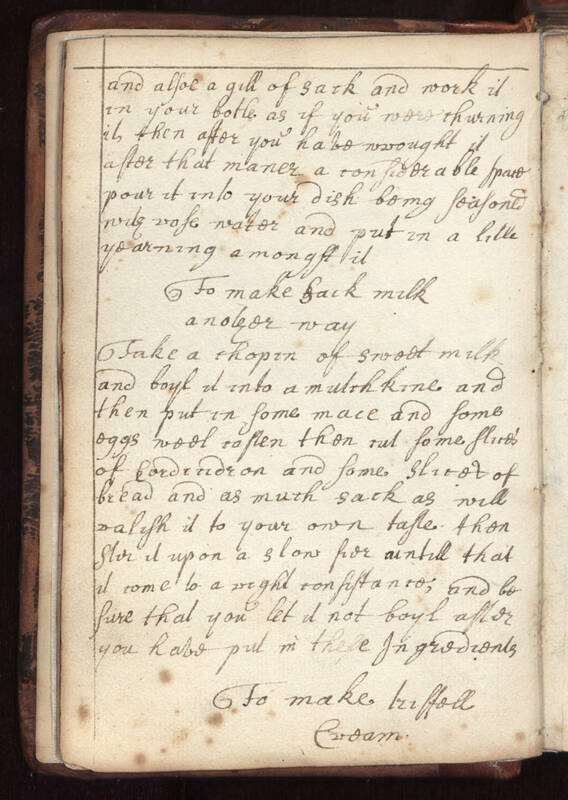 To make sack milk another way. Take a chopin of sweet milk and boyl it into a mutchkine and then put in some mace and some eggs weel casten then cut some slices of [cordindror?] and some slices of bread and as much sack as will ralish it to your own taste then stir it up on a slow fier untill that it come to a right consistance, and be sure that you let it not boyl after you have put in these ingredients. To make [triffell?] cream.